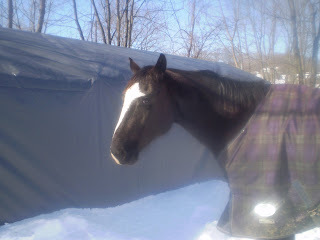 This is our horse Sandy. 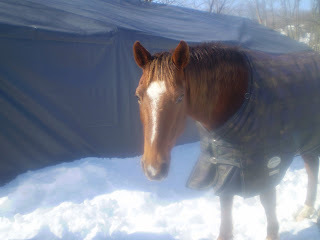 She is a chesnut/sorrel quarter horse mare. She is almost 18 years old. She is a great horse. She has quite a personality. As long as she knows you are her leader she is fine. However, she likes to be queen, so if she thinks you will let her lead...well, she will try. She is not a mean horse at all, just strong minded! This is Cheyenne, our boarder! She is a black and white paint mare, almost 6 years old. Cheyenne is special - she has a club hoof. It doesn't hinder her daily life and she can be ridden. She has a very sweet temperment. She is a great pasture pal for Sandy.